Only man can speak. ものを言えるのは人だけだ. You should not speak with your mouth full. 口いっぱいほおばってしゃべってはいけない. Would you speak more slowly? もっとゆっくり話していただけませんか. (This is) William speaking. [電話で](こちらは)ウィリアムです. 〔+前置詞+(代)名詞〕〔人と〕〔…について〕話す，話をする 〔to，with〕 〔about，on，of〕《★受身可》《★【用法】 〔人と〕の前置詞は to が一般的だが，with の場合には談合・意見の交換が暗示される》. I'll speak to [with] her about [on] the matter. 私はそのことについて彼女に[と]話しましょう. He always spoke of you lovingly. 彼はいつもあなたのことを愛情をこめて話していました. Language is often spoken of as a living organism. 言語はしばしば生きた有機体と言われる. [generally などの様態の副詞を伴って speaking で] (…の言い方で)言えば. strictly [roughly, generally, honestly] speaking 厳密に[大ざっぱに, 一般的に, 正直に]言えば. The lecturer spoke (for) about an hour. 講師は約 1 時間講演した. It's an honor for me to be able to speak to you today. 本日皆さんにお話ができるのを光栄と思っております. The newspaper speaks to a lot of people. 新聞は大勢の人に語りかけている. This poem speaks of memories of his childhood. この詩は彼の幼年時代の思い出を語っている. Actions speak louder than words. 《諺》 言葉より行動のほうが雄弁である. His eyes spoke of sleepless nights. 彼の目を見ると何日も眠っていないことがわかった. Mr. Jones speaks three languages. ジョーンズ氏は 3 か国語を話す. What language do they speak in Canada? カナダでは何語が話されますか. No one spoke a word. だれも何も言わなかった. No one spoke a word to me. だれも私にひとことも話しかけてくれなかった. Shall we speak in English or in Japanese? Though chimpanzees are quite intelligent, they cannot speak. I heard those two are not speaking these days. She speaks to everyone frankly. I'd like to speak to Mr. Jones, please. “Can I speak with Tom, please?"“Speaking." They spoke with the teacher in charge about their son. I was asked to speak about my experiences in Nepal. He stood up and spoke against the dam project. Do you speak Chinese?中国語は話せますか（Can you ...?と聞くと相手の能力を直接尋ねて失礼な感じになるので，Do you ...? They speak Portuguese in Brazil. The girl wouldn't speak a word. I have been quiet until now, and I think it is time I spoke my mind. I can't speak for everyone, but I think your speech was right on target. His actions speak for his true feelings. I am sorry but all the tickets have been spoken for. She had never spoken of her children until today. Speak of the devil . Her eyes speak of her sadness. It is time for all of us to speak out against racism. Someone is going to have to speak to her. Van Gogh's art really spoke to me. Could you speak up? It is hard to hear at the back. He spoke up for the union's strike. I took lessons in calligraphy, dancing and flower arrangement, not to speak of the tea ceremony. “Anything new? "“Nothing to speak of." He is, so to speak, a fashion leader. Let him speak for himself. “I think we should all vote to strike. "“Speak for yourself!" The newspaper editorial spoke highly of the new mayor. Speaking as a student, I think some teachers talk a lot but never listen. Speaking of my aunt, she is coming to visit next week. Be careful not to speak too soon. The math teacher always spoke well of you. They were so tired from climbing that they couldn't speak. She speaks to everyone in a quiet whisper. I'd like to speak to Mr. Jones about the air tickets, please. A: Can I speak with Tom, please? B: Speaking. When did you speak with him last? I was glad to hear you speak about how we could improve our school. Only one man stood up and spoke against the dam project. His biography spoke of a less busy, more peaceful time. She speaks [can speak] four languages. They speak Portuguese in Brazil. = Portuguese is spoken in Brazil. speak : 音を出す一方向性に焦点がある.音の出し方に関心があれば speak louder [clearly, slowly]などと言う.「オウムはしゃべる」はParrots speak. が一般的(ただし「話しかける」という意を強調すれば This parrot talks to me. とも言える). talk : 相手の存在と双方向のやりとりに焦点がある.「金が物を言う」は<金で誰かと取り引きをする>という意味合いがあるため Money talks. と言う. say : 発話内容に焦点がある.He talked a lot, but didn't say much.は「彼は口数は多かったがたいしたことはしゃべらなかった」という意.a sayingは「格言,諺」の意になるが,それはsayが内容に焦点を置くため. tell : 相手に対して内容の伝達に焦点がある.<相手に伝える>ということから tellingは「効き目のある」という形容詞.またtell onに「影響を与える,こたえる」といった意味があるのも伝達の応用例である. Today I speak for this poor man about to be executed. I am sorry but all of the tickets have been spoken for. Speak [Talk] of the devil (and he will [is sure to] appear). It took courage but the women finally spoke out about their harassment at work. It is time for all of us to speak out against racism and hatred. I was once spoken to by a Taiwanese in English. She still hasn't finished that work. Someone is going to have to speak to her. As she began to speak up about her ideas, everyone became quiet. The president spoke up for the union's strike. He is not on speaking terms with his brother. I am on speaking terms with the deputy mayor. Personally speaking, I don't really like the class or the teacher. In a manner of speaking, he is the "boss of rock-n-roll." A: Anything new? B: Nothing to speak of. After his many health problems, he has become, so to speak, a medical expert. A: I think we should all vote to strike. B:Speak for yourself! I say we work. His behavior speaks ill for boxing. Her success speaks well for the welfare program. Speaking as a student, I think many teachers talk a lot but never listen. Speaking of my aunt, she still keeps working actively. I think you are speaking out of turn and advise you to be silent. My and boss and I speak the same language when it comes to politics. Be careful not to speak too soon; it can get you into trouble. His continued financial support speaks volumes about his commitment to fighting HIV. From Middle English speken (“to speak”), from 古期英語 specan (“to speak”), alteration of earlier sprecan (“to speak”), from Proto-Germanic *sprekaną (“to speak, make a sound”), from Proto-Indo-European *spreg- (“to make a sound, utter, speak”). Cognate with West Frisian sprekke, Low German spreken (“to speak”), Dutch spreken (“to speak”), German sprechen (“to speak”), and also with Albanian shpreh (“to utter, voice, express”) through Indo-European. (intransitive) To communicate with one's voice, to say words out loud. I was so surprised I couldn't speak. (intransitive) To have a conversation. It's been ages since we've spoken. (by extension) To communicate or converse by some means other than orally, such as writing or facial expressions. He spoke of it in his diary. (intransitive) To deliver a message to a group; to deliver a speech. This evening I shall speak on the topic of correct English usage. (transitive) To be able to communicate in a language. I was so surprised that I couldn't speak a word. 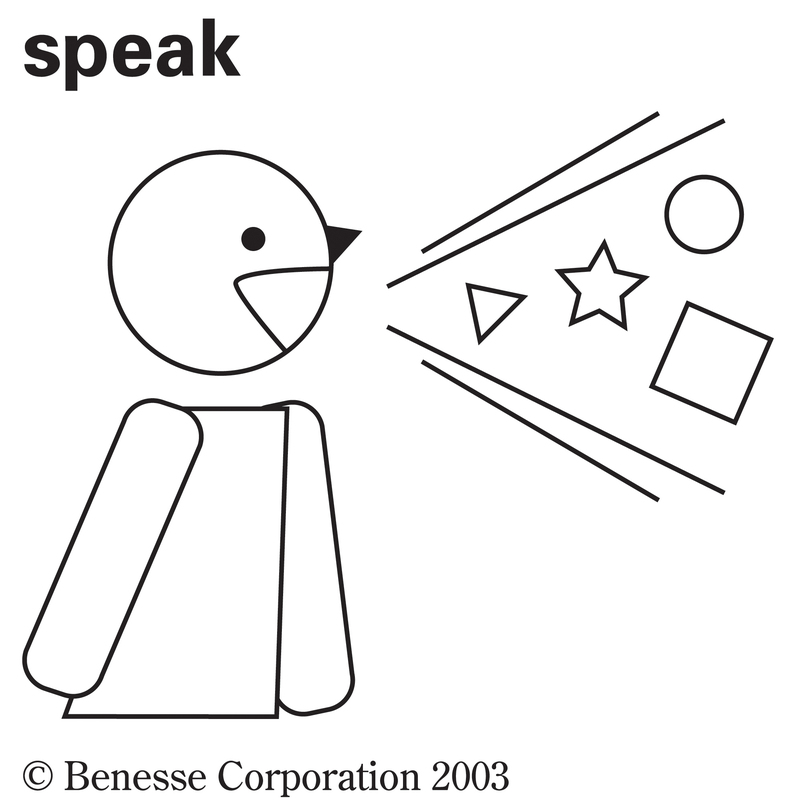 (transitive) To communicate (some fact または feeling); to bespeak, to indicate. (informal, transitive, sometimes humorous) To understand (as though it were a language). Sorry, I don't speak idiot. (intransitive) To produce a sound; to sound. (transitive, archaic) To address; to accost; to speak to. Each village senior paused to scan / And speak the lovely caravan. language, jargon, or terminology used uniquely in a particular environment or group. (dated) a low class bar, a speakeasy. Probably originally from Newspeak, coined by George Orwell in his book Nineteen Eighty-Four. Indicates a manner of speech or writing typical of or characterized by the root term. On the American side, one motive for this is usually couched in the most delicate diplomat-speak.